The hottest ticket in the Netherlands this spring is probably the one that grants its bearer entry to the exhibition of the late works of Rembrandt at the Rijksmuseum, which runs until May 17. The museum sells a limited number of timed tickets for entry, but even so, on a recent visit I found the galleries overcrowded and stifling, leaving little opportunity to study the paintings in peace. Before opening at the Rijksmuseum, the same exhibition was shown at the National Gallery in London where an awestruck critic at The Guardian newspaper exercised her imagination on the paintings and their creator. I can only assume that she saw the paintings in the relative peace of a press viewing. Yet, despite the crush, the uncomfortably hot galleries, and the annoying way that some people hovered in front of the paintings composing photos for their posts on Twitter and Facebook (do I sound bitter? ), there were moments that struck deep. The Apostle Bartholomew in the Contemplation section of the exhibition stopped me in my tracks. For this portrait, Rembrandt used light to create an impression of a man intent on animated discussion with someone not shown in the frame. Most of the figure is rendered in warm shades of brown, only the face and the right hand holding the instrument of the Apostle’s martyrdom, a flaying knife, reflect the light. I was smitten the moment I caught sight of the painting from across the room. The energy was such that I could hardly believe that Bartholomew was a creation in oil on canvas. Incidentally, the provenance of the painting described on the website of the current owner, the Putnam Collection at the Timken Museum of Art in San Diego, makes for interesting reading. In 1757, the portrait was purchased by Sir Joshua Reynolds for the sum of 26 guineas. In the late 18th century, the portrait made its way to Russia before returning to London in 1912 where it was snapped up by an American buyer, Henry Goldman, a banker and the son of the founder of Goldman Sachs. Before entering the crowded Rembrandt galleries, I had spent a little time in the Asian Pavilion where these three statues are on display. Reflecting on the whole experience, I see that my feelings about the exhibition are well represented here: astonishment followed by irritation and then attentive resignation. Mind you, the figure on the right is a lohan, a follower of the Buddha who has achieved spiritual perfection – not something I would claim! A lohan also possesses supernatural abilities, including the ability to change size and to see and hear everything. Changing size, specifically, growing considerably taller and wider, would have been very useful on the day. Image credits: The featured image of the Rijksmuseum is the work of John Lewis Marshall. 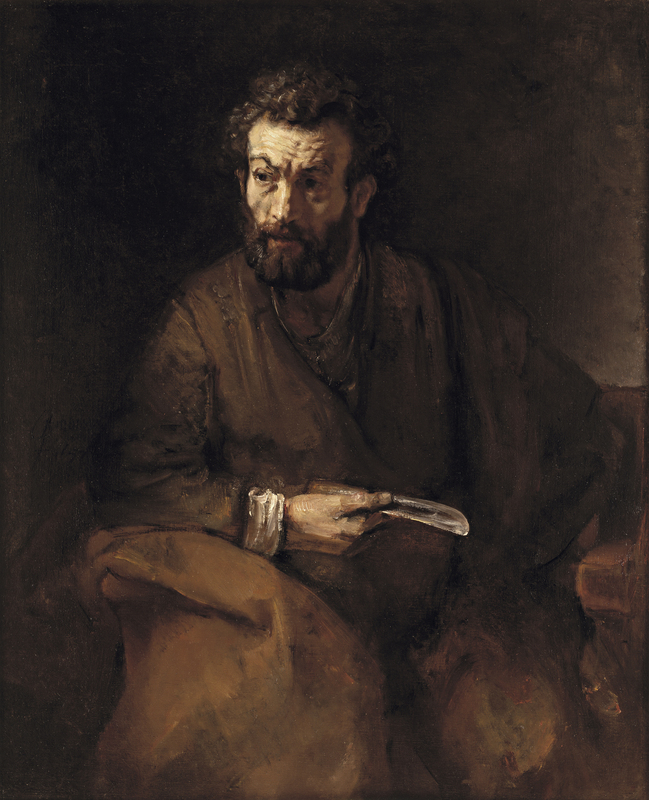 The Apostle Bartholomew was downloaded from the website of the Timken Museum of Art. 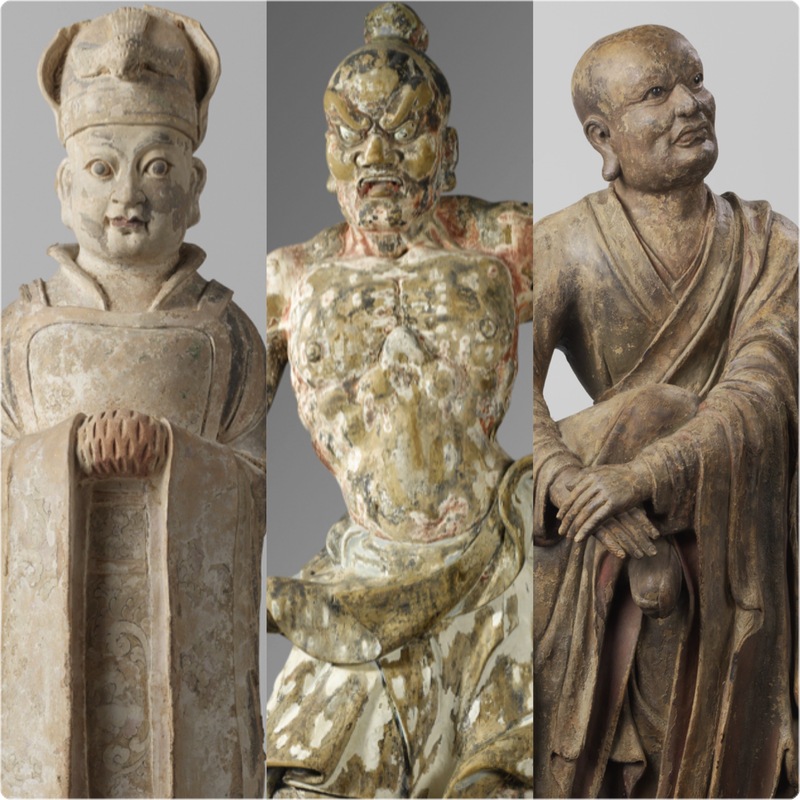 The image of the Asian statues is a composite of three photographs downloaded from the Rijksmuseum online image library. Ah! The agony and ecstasy of modern exhibitions. The problem being that so many other people think they want to see them as well….. perhaps just to put that little fact up on facebook. Should we try giving all visitor a questionnaire on the subject 24 hours after their visit? By the way, I love St Bartholomew …. so little known, so much speculated. And often represented holding his own flayed skin! That’s chuzpah for you. So well painted, yourself, Lis-Britt! Thank for taking us along on your visit. Our Nick loved his visit to this museum some few years ago… A special place. Perhaps it’s time for another visit now that the museum has been returned to its full glory. It is really an amazing, if bewildering, place.